You can pick from an overnight to a 5 day trip. All you need to bring is your personal gear including sleeping bag. We’ll provide everything else including the tent. With the larger groups we’ll add another cook and/ or wrangler. We do the Dutch oven cooking for cowboy breakfasts and dinners. Entree’s such as chicken enchiladas, filet mignon and prime rib. Take a load off. 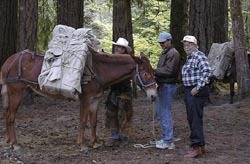 Hire my mules to pack in your gear! I will come back on a prearranged day and pack you out. 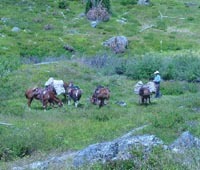 You have the choice to ride a horse in and out or hike. 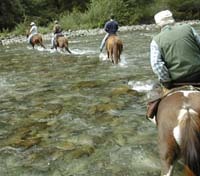 With this trip you decide whether you will stay overnight or up to 5 days. You provide the food and do the cooking and feed the wrangler. That way I can do the horse chores a little quicker and enjoy your culinary delights. If your trip is for more than 2 days and you would like to progress to more than one campsite during your ride; then it will be $50 more per person per move. I need a heads up on this one as I may need to sign on an extra wrangler.